Two Straight Speak on to Right Angle Speak on 100' Speaker Cables. Model TW12SRT100 (2 Pack), Speak on to Right Angle Speak on Connectors, 12 Gauge Wire, 2 Conductor, PVC Wrapped, Shielded, Locking features, Color: Black, Length: 100 Feet, Condition: NEW, One Year Warranty. Whether you have a permanent installation or mobile, Seismic Audio's Speak on compatible Speaker Cables are rugged enough to handle whatever you throw at them - road ready and built to last. The quality of the cables you use to connect your sound equipment is critical if you are looking for an accurate music and sound reproduction. 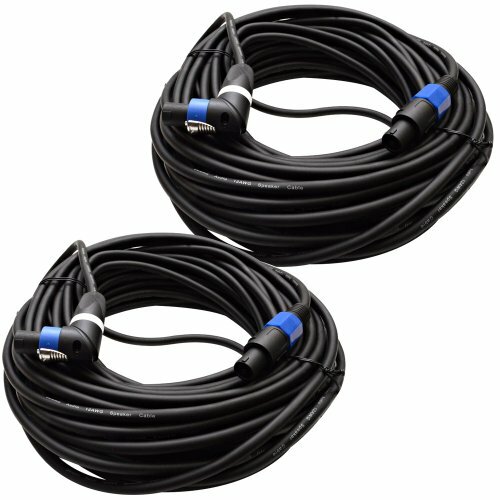 Awesome quality speak on speaker cables are very hard to find, especially at a decent price. The Seismic Audio brand was designed to make the professional musician, as well as the musician low on cash, sound great. With your purchase, you will receive two speak on straight to speak on right angle speaker cables pictured and described above. So, put it in your cart today and get ready for years of trouble-free, crystal clear sound!